Meyer lemons, as I have mentioned before, are a type of lemon that is actually a hybrid between a tangerine or mandarin orange and a lemon. As a result, the fruit is slightly smaller than your average lemon and significantly sweeter, although it still has a very lemony flavor. Tasting a meyer lemon is more like tasting lemonade – albeit tart lemonade – than a regular lemon, as it lacks some of the bitterness that the ordinary lemons have. Meyer lemons can be used in the same way as regular lemons, but will often impart a greater lemon flavor, since it does not have to be tempered by extra sugar. This is why meyer lemons work perfectly in these scones. They have a nice fresh lemon flavor that is not aggressive, and they are not very sweet, so you can taste the butteriness that makes scones so delicious in the first place. The technique for scone making is very easy, since everything goes into one bowl. You do need to practice rubbing the butter into the flour, working it into a coarse, sandy mixture, but you can always cheat by pulsing the mixture in the food processor 5 or 6 times. These scones are crisp on the outside, soft in the midde and not too dry. 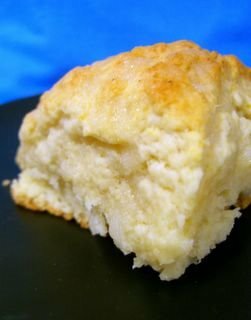 The lemon “glaze” must be added when the scones are hot out of the oven so it can set up without softening the “crust” on the top of the scone. I suggest having a couple extra lemons on hand in case you need extra juice, although you could always try adding in a regular lemon if you have to. In a medium bowl, whisk together flour, baking powder, baking soda, salt and sugar. Add butter and toss to coat. Using your finger tips, rub the butter into the flour mixture until it resembles very coarse sand. A few large bits are ok, but most should be smaller than a pea. Add 5-6 tablespoons of orange juice and zest and stir dought with a fork. Add remaining juice until dough comes together into a not-too-moist ball. Divide dough in to two balls and flatten onto baking sheet to for discs about 1-inch thick. Divide each disc into quarters and separate slightly. Bake for 20-22 minutes, until scones are a light golden color. A toothpick should come out clean, but color is a reliable indicator for these. Makes 8.For the “glaze”: Mix together a few tablespoonfuls of white sugar with a tablespoon or two of lemon juice to make a paste. Drizzle on scones when hot out of the oven. Let scones cool before eating. I love scones and I would love to find Meyer Lemons here in SC but I have never had that luck. These look delicious! hi Nic I’ve been reading your blog for a while now and I forgot to tell you that they offer Doubletree cookies during the aids walk event in West Hollywood every year and they are simply the best! Meyer lemons are one of those items that I always keep my little eyes peeled for, but never find. I haven’t gotten around to writing much about them, but scones are one of my absolute favorite things to bake and eat. Both american style or lighter cream scones are fine with me. These sound so great. And yet another thing I miss about living in Cali. I’ve never seen a meyer lemon in Ontario or MI. Love scones! 🙂 And would love to finally see and taste a Meyer lemon…I keep reading about it and it is starting to take mythical proportions in my brain! We are lucky to have a Meyer lemon tree in our yard. It bears nearly year round. P.S. – oopsie – in the body of your directions you say “orange” juice… I know you don’t mean it. Looks lovely – I haven’t heard much about meyer lemons or have yet to try making scones. Hi, Nic! I am writing from Brazil, and I’ve always wanted to know what scones are! Are they like biscuits? I always make biscuits, but I wanted to know what to aim for when making scones. Yours look delicious! I love scones – so easy to make! I’d never even considered the idea of lemon scones before, but I can imagine how the tanginess works with the soda flavour. Definately worth a try. they look great!! I have a recipe for lemon rosemary scones that are wonderful. I’ll check the Whole Foods and Central Market stores for Meyer lemons. Love your blog! How do you find the time to bake so often? I’m jealous. Hello! Thank you for the recipie, I was just looking for something to bake to use up my left over lemons (not meyer sadly). And I haven’t had scones for a long while! Thanks! I just found Valley lemons at Central Market last week. Valley lemons are the Texas answer to Meyer lemons. I’m not sure that they are as sweet as the Meyers, as they seemed pretty tart when I tried a bit at the store. I suppose a section of lemon is never going to be as sweet as an orange, however. These looked/sounded so great, I was inspired to make my own! but no meyer lemons, unfortunately have yet to find any in these parts. What about adding some lemonade in place of the Meyer lemon juice if we can’t get Meyer lemons where we are? That would add the sweetness that regular lemons perhaps do not have. Hi Nicole! Just wanted to let you know how much I adore your blog! I found Meyer lemons here in Ottawa and chose to make these scones with them…amazing! They were a big hit with anyone lucky enough to try one. Small request: could you please edit the recipe? You mention baking soda in the ingredients list but it’s not in the instructions. I hadn’t noticed the first time I made them, and the second time around I forgot to add the baking soda because I was rushing and just read the instructions! Then I started fretting and wondering where the mistake was: the ingredients list or the instructions? A friend gave me a bag full of Meyer lemons, what a difference, they are delicious I made lemon bars for the first time; and the best lemonade ever! Today I will try your lemon scones. Thanks for sharing! I live in Southern California and have a Myer Lemon tree that produces prolifically almost year round. One year I tried to use all of the lemons on the tree! I love to bake and everything I was baking was with the Myer Lemons, had to stop because my husband and I gained too much weight. I made these today and they were phenomenal. These are the best scones that I’ve ever eaten and I’ve had my fair share, thanks Starbucks. I baked them for 20min and they were incredibly moist. The only thing I changed was in the glaze where I used powdered sugar. I can’t wait to make these again. Thank you!! Sweet Remedy » Lemon Scones – Fresh Spring Recipe!